Colorado Peak Politics | SAVIOR OR EMPTY CHAIR: Did HD3 Rep. Daniel Kagan Save or Shutter the Family Business? SAVIOR OR EMPTY CHAIR: Did HD3 Rep. Daniel Kagan Save or Shutter the Family Business? We took a closer look at Kagan’s business, Kagan Textiles, in the United Kingdom. It would appear from the financial statements that the Kagan family (including his mother and brother, who also served as directors) dissolved – not saved – the family’s company. In fact, during his time on the board of directors, Kagan liquidated nearly £20 million in company assets. Kagan was appointed a director of Kagan Textiles from September 1, 1996. For the period ended January 31, 1996, gross revenue totaled approximately £493,000. Of this amount, £417,000 was derived from rental revenue and interest income. The cash the company had on January 31, 1996 was £605,000. At the end of 2008, the company’s revenues were £684,320 and they had £13,580,191 cash on hand. Selling off nearly £20 million in company assets doesn’t exactly equate to “rescuing” a company. Those are the actions of someone who is dissolving the company, which Kagan did formally on July 19, 2011. 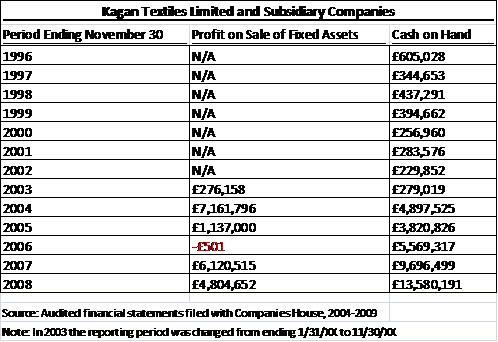 Further, to give you a concept of scale, in 2007, Kagan Textiles collected approximately £80,000 in gross rents and earned approximately £274,000 in interest, while the company recorded a £6,120,515 profit on the sale of fixed assets (e.g., real estate). Original statement: the principle activity of the company and group is that of an investment and holding company. The group markets textile products and receives rents from investment properties. Revised: The principle activity of the company and group is that of a property and investment company. Translation: There is nothing indicated in these statements that shows Kagan’s company was materially engaged in the manufacture, purchase or sale of textiles. Substantially all income appears to be from real estate-related activities. Finally, while Kagan was on the board of directors, he allowed his family to use this company as a piggybank, offering over one million dollars in unsecured loans to various family members at zero percent interest. We’re not going to belittle Kagan for helping out his family, but these types of transactions are the mark of questionable corporate governance. If Daniel Kagan wasn’t a member of the State Legislature who is trying to use his business experience as a reason voters should elect him, none of this would matter. And, had Ferrandino not said Kagan had gone home to England to “save” the family business, it wouldn’t matter. But, neither Kagan nor Ferrandino are being truthful about Kagan’s business. 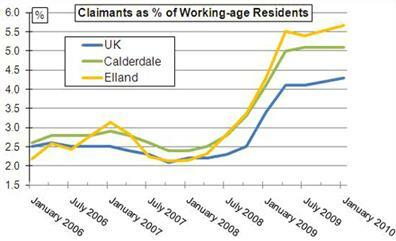 Unfortunately, now Elland, the town in which Kagan Textiles formerly existed has unemployment exceeding the district around it as well as the rest of the UK. But, don’t worry, Daniel Kagan is tucked away in his posh $2.3 million mansion – purchased for him by the millions liquidated from Kagan Textiles.